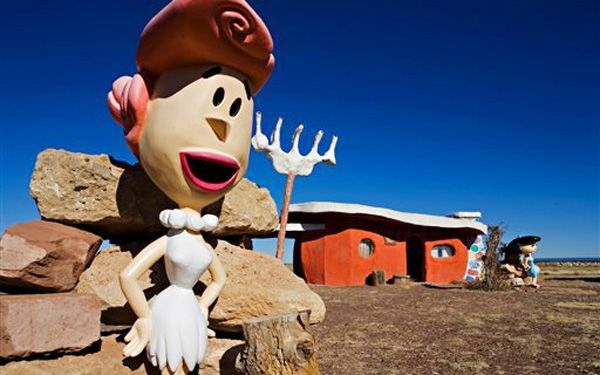 The owner of Flintstones Bedrock City, a northern Arizona theme park designed around the Hanna-Barbera cartoon, is selling the property and the price is $2 million. Linda Speckels said she is ready to retire from operating the park and campground in Williams. It is located about 30 miles south of the Grand Canyon. "I'm 73 years old, I don't have that many more years of adventure time left," said Speckels. She has been trying to sell the place for more than a year. "I love the property, but I feel like it's time for somebody else to come in and enjoy it and do something with it." The price, however, does not include the image licensing of everyone's favorite modern, stone-age family. Warner Bros. currently owns Hanna-Barbera properties. But Speckels has renewed her own deal over the years with different licensors. New owners would have to work out their own licensing agreement. Speckels said she is optimistic that anyone who would care enough to buy the park would be able to work out a deal on the licensing. She, personally, would like to see the prehistoric props stay. "A lot of people think of this as art, especially architects and photographers," she said. Speckels started operating Bedrock City with her husband, Francis "Hudi" Speckels, in 1972. The "Flintstones" attraction was a spinoff of one Francis Speckels' parents started in Custer, South Dakota. Francis Speckels died in 1990, but Linda Speckels continued running the park. 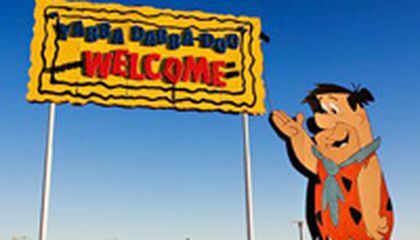 The stone age village includes Fred's Diner restaurant, gift shop, theater and RV park. Among the attractions is a train that rides through a volcano and a slide down a dinosaur's tail. The $2 million purchase also includes 30 acres of land. Speckels' daughter, Holly Hulen, who occasionally helps out, said business has been good the past year and that the park is still a draw. "She has survived 42 years, which is really amazing for a small business," Hulen said. "But she's going to be 74. It's time for her to retire." "The Flintstones" was one of several popular animated staples created by Bill Hanna and Joe Barbera. The program followed the antics of Fred Flintstone, his wife, Wilma, and their friends, Barney and Betty Rubble. The animated show was one of the most watched prime-time TV shows in the 1960s. It was revived in the 1980s and spawned several TV specials and live-action film adaptations. A lot of parents visiting the park like being able to introduce their children to "The Flintstones," Speckels said. "We're getting a lot of third-generation families with kids and their grandparents," she said. "Everybody can relate to Fred and Wilma." Critical thinking challenge: Why is the true cost more than $2 million? The owner of the Flintstones park might have wanted to retire from the work that she had been able to work hard for the park that had been built as a park from an animated film that people might have wanted to turn it into a park. The Flintstones park had been able to turn an animated film that had been created by two people and another two people that wanted to create a film into a park. The owner might have wanted to retire after the long, hard work and without her husband to help her out after he had died which she had been working all by herself that she would need to retire. People might have been able to find out more about the park that the owner and her husband had made which people might wanted to decide whether to buy the park to work or not buy the park. Critical Thinking Question: Why is the true cost more than $2 million? Answer: I know that the true cost is more than $2 million because after all the work working all alone she would nee to sell with a big price after a long hard work all alone.